From the leading distributor of spices and seasonings posting quarterly results to the top dog in corporate identity uniforms providing a snapshot of corporate America, here are some of the things that will help shape the week that lies ahead on Wall Street. The new trading week kicks off with Cintas (CTAS) reporting quarterly results. 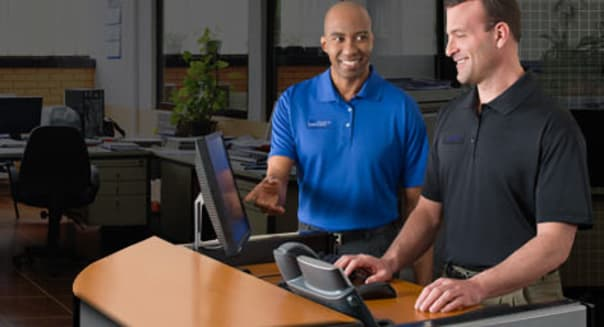 Cintas is the leading provider of leased company uniforms and other workplace essentials. The role it plays makes it a great bellwether for the state of corporate America. If companies are hiring, you will see it in an increase in revenue as orders pick up. Analysts see profitability improving at Cintas when it reports on Monday afternoon, but they also see revenue declining slightly. Microsoft (MSFT) is hosting a press event in San Francisco on Tuesday. It was initially rumored to be the software giant's unveiling of Windows 9, but more recent reports speculate that Windows 9 won't be ready for public preview until next month. Microsoft has plenty of work to do in swaying a marketplace that wasn't wowed by Windows 8. The next operating system will likely retain many of the popular existing features while also bringing back some of the Windows 7 offerings, like making it easier to switch from the tiled layout of Windows 8 to the standard Start menu of Windows 7. The fourth quarter officially kicks off on Wednesday. One company stepping up with fresh financials is Acuity Brands (AYI). The Atlanta-based provider of lighting solutions rang up $2 billion in sales last year across roughly two dozen brands. Wall Street pros see revenue climbing 12 percent in its fiscal fourth quarter. The analysts also see Acuity checking in with a profit of $1.22 a share, up nicely from the $1.03 a share it posted a year earlier. Things should spice up on Thursday morning when McCormick (MKC) reports its quarterly results. McCormick is a leading distributor of spices, seasoning mixes, condiments, and other flavoring products, ringing up $4 billion in sales a year. Analysts see modest improvement in sales and earnings, but the company has also been able to exceed Wall Street's profit targets in each of the past three quarters. That's an encouraging trend as we head into Thursday's report. It will be quiet on the earnings front on Friday, but it's another story for exhibitors, with a few movies making their theatrical debuts. "Annabelle" kicks off the slate of horror films that typically spring up in October ahead of Halloween. David Fincher is also directing the film adaptation of the popular "Gone Girl" book, likely to be the weekend's biggest draw. There's also Nicholas Cage starring in the Rapture-themed "Left Behind." There's going to be a lot of popcorn heating up at your neighborhood multiplex. Motley Fool contributor Rick Munarriz has no position in any stocks mentioned. The Motley Fool recommends Cintas and owns shares of Microsoft. Try any of our Foolish newsletter services free for 30 days. To read about our favorite high-yielding dividend stocks for any investor, check out our free report.